Place one granola thin on a microwave-safe plate. Place 2 marshmallow halves to make the base of the eyes, cut side down and touching. Place 2 yellow candy melts, one on each marshmallow half, flat side up. Microwave on the plate for a few seconds, until the marshmallows puff slightly and the yellow candy begins to melt. Remove plate from microwave and add the chocolate chips for the pupils of the eyes, and the candy corn kernel for the beak. Allow to set before serving. Repeat to finish remaining s'mores. Owl s'mores? Whooo said fall party treats can't be a hoot and easy?! Help! The owl sayings are falling into my head, and I can't get 'em out! We found this owltrageous idea on the internet and just couldn't pass it up. 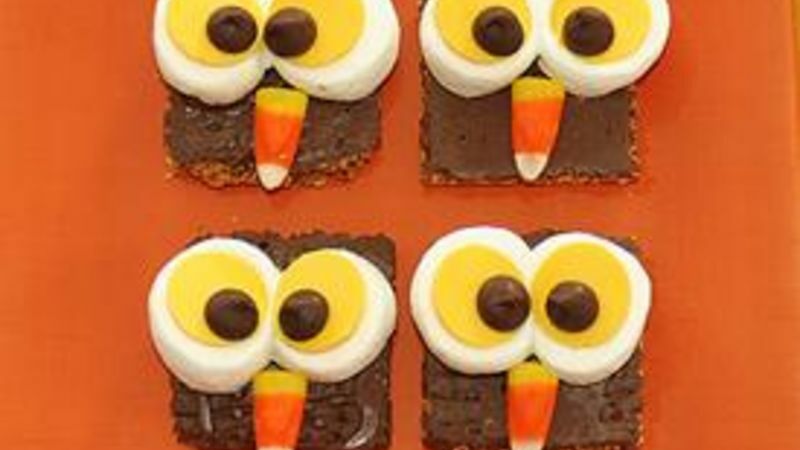 These Owl S'mores take just minutes and add a super adorbs touch to your party table. Start with some Nature Valley Granola Thins. I used Dark Chocolate-Peanut Butter flavor, but you can use whatever makes your eyes go googly. Also grab some mallows (cut in half), dark chocolate chippers, candy corn, and some yellow candy melts. Then it's Assembly Line 101. Plop one granola thin on a microwave-safe plate, chocolate side up. Add two marshmallow halves so they're touching like big ol' owly eyes. Add 2 yellow candy melts, flat side up. Nuke the plate for a few seconds until the mallows puff up and the yellow candy starts to melt. Add the chocolate chips for the eyes and a candy corn kernel for the beak and ... whooo do you think you are, you owler, you! Here they are -- ready to party!